The initial phase of primary arthrofibrosis occurs within the first few weeks following the operation or injury that triggers this condition. At this time period, the arthrofibrosis is considered transient, as limitations in knee flexion and extension usually resolve with conservative treatment as long as the patient complies with the physical therapy program. However, if the losses of knee flexion and extension go untreated for a few more weeks, the condition becomes more established and requires operative management. 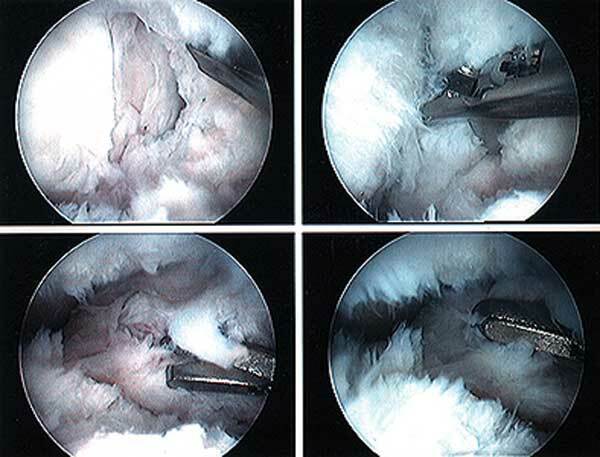 At this point, arthroscopic debridement and removal of scar tissue throughout the knee joint can be effective in solving a limitation of knee extension, flexion, or both. The figure shows a knee that has extensive scar tissue deep inside the joint. Usually, no more than 12 weeks have elapsed since the original event that triggered the arthrofibrosis – the operation or knee injury. Contracted tissues surround the patella, limiting mobility. The patella can be moved 50% of its normal limits (compared to the opposite patella) – medially, laterally, proximally, and distally, but it is difficult to move and can be painful. The figure shows such a case, where some mobililty is present but it is definitely decreased compared to the opposite knee (Fig on right). There is a “hard stop” during the clinical examination when the surgeon attempts to move the knee that indicates scar tissue is present throughout the knee joint. It is important to note that an extensive clinical evaluation is required before undertaking any operative procedure for arthrofibrosis. In my clinic, this entails joint aspiration with cell analysis and culture to see if an infection is present. X-rays are taken to measure the height of the patella in the affected knee and compared with the opposite knee. A bone scan and MRI are often done to determine if the condition is primary or secondary to another problem. Often, there is diffuse edema (swelling), increased warmth about the knee, constant pain, limited patellar mobility, contracture of soft tissues, tenderness in the fat pad, and limits in both extension and flexion. Anterior knee pain, stiffness, pain with attempted knee motion, a flexed-knee gait, and severe quadriceps atrophy are common findings. In severe cases of established arthrofibrosis, more extensive surgery is requred than an arthroscopic debridement, lysis of adhesions, and removal of scar tissue. This subject is covered in the next part of this course. 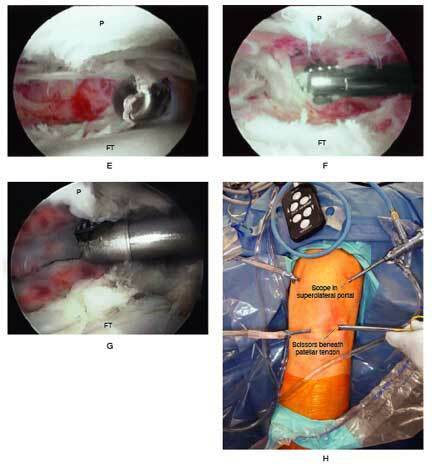 A demonstration of an arthroscopic technique for debridement of contracted tissues in a knee with arthrofibrosis is shown in the figures below. This patient had a restriction in medial-to-lateral translation (glide) of the patella, with a contracture of the medial and lateral retinaculum. However, there was still 50% of normal patellar mobility present indicating that an arthroscopic technique could be used and an open extensive technique was not necessary. There was a limitation of motion of 0/5/90°. E, A shaver is placed into the suprapatellar pouch and translated in a superior and inferior plane to re-establish a space sufficient for the initial arthroscopic debridement. There is a band of scar extending from the superior patella to the trochlea, and dense suprapatellar adhesions. Debridement of suprapatellar scar tissues is performed. F, The soft tissues and synovium over the anterior femur are not removed to leave a gliding soft tissue surface. G, A resection of scar tissue beneath the vastus medialis oblique and vastua lateralis oblique muscles may be required because this scar can limit muscle mobility. H, The arthroscope is placed in the superolateral portal to view the infrapatellar region and debride an infrapatellar contracture. I, A view through the superolateral portal shows the fat pad and instruments to remove infrapatellar scar tissue. Care is taken to not transect the anterior medial and lateral meniscus attachments. J, Extensive synovium and scar is removed from the medial and lateral recesses and intercondylar notch. There may exist scar tissue proliferation on the anterior aspect of the medial and lateral meniscus blocking extension that requires removal. K, The knee is placed at 30° flexion and sufficient medial and lateral parapatellar contracted tissue and retinaculum are removed to allow for a normal medial-lateral glide. This release rarely extends above the mid portion of the patella. L, Scar tissue in the notch region is removed that may block extension. In knees that had an ACL reconstruction, a notchplasty may also be required to allow full knee extension. 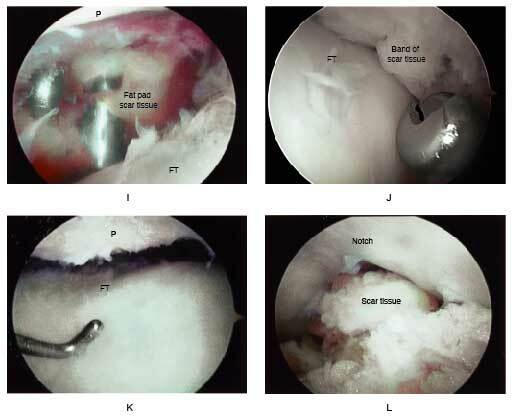 After completion of the arthroscopic procedure, the knee is placed into a bulky compression (cotton-ace-cotton-ace) dressing with an ice bladder incorporated into the dressing. The patient is usually kept in the hospital for 2-3 days for an intensive in-patient physical therapy program that is discussed later in this course. Then, the patient continues with supervised physical therapy in the clinic and performs exercises at home several times a day in order to maintain the motion gained by the arthroscopic procedure.